Well, here I am still saying “things take time”. This time, things really are better even if they’re not completely well. Recent Doctors visits confirm that I’m “on target” whatever that means. Anyway, I am finally feeling better and there is hope that things will return to a better state. 2) Attended a motor home rally August 6 – 9 with 60 or so of our closest friends. There is one thing that’s significant here. We recruited 4 new members who coincidentally are all professional musicians. 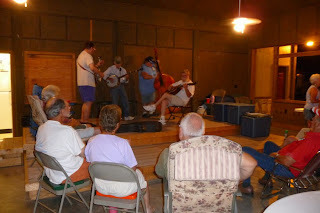 Translation, our motor home club now has it’s own bluegrass band. We expect that this will make for good times in the future. 3) Attended a day of fun on August 22 with another group of 80 of our newest close friends. Our car club is celebrating it’s 50th anniversary in 2010. This is such a nice group of fun loving people. The group just happens to be glued together by a common interest in a car, the American icon, the Corvette. 4) We leave tomorrow for a week or two in Pennsylvania. While there, we’ll enjoy the culture of the people, visit with friends and spend a couple of days in Carlisle for the annual Corvette show. 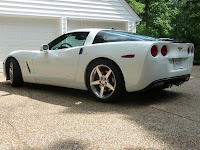 This entry was posted in Home, Rally and tagged Bluegrass, Corvette, Dogwood, friends, Health. Bookmark the permalink.